The current breakthroughs in information and communication technologies (ICTs) have created tremendous opportunities for sharing information on a global scale. As noted by Jamil Jreisat in a 2005 Public Administration Review article titled “Comparative Public Administration Is Back In, Prudently,” the sharing of scientific and technological inventions has accelerated globalism and enabled scholars and practitioners to compare their methodological approaches for the sake of building a grounded body of scientific knowledge. This increasingly comparative focus has prompted Brazilian public administration scholars and practitioners to initiate a bi-annual meeting to discuss Brazil’s dynamic practices and concerns, while producing research that is relevant to a wider set of issues in other parts of the world. The chair of ASPA’s Section on International and Comparative Administration (SICA) delivered an international lecture during the VI Brazilian Meeting of Public Administration Researchers, held Nov. 16- 18, 2014 in Belo Horizonte, (Beautiful Horizon), Brazil’s second most populous state. This high-level meeting was organized by the Graduate National Association and Research in Administration (ANPAD). 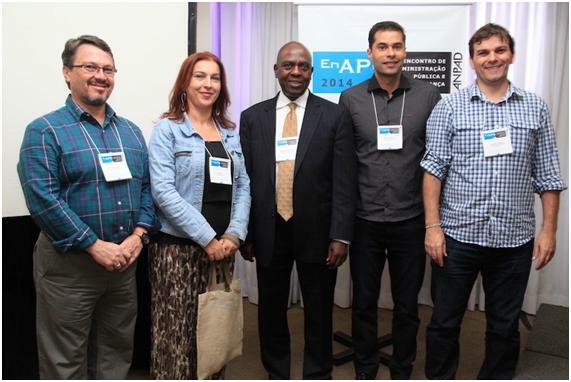 This photo features Dr. Gedeon Mudacumura, SICA Chair, standing with four members of the scientific committee that coordinates the Public Administration Division in Brazil. On his left, Dr. Alketa Peci (FGV-Brazil) and Dr. Ricardo Gomes (UNB-Brazil). On his right, Dr. Marco Ferreira (UFV-Brazil); and Dr. Sandro Cabral (UFBA-Brazil). This Brazilian experience continues the multi-directional public administration research geared toward exploring pertinent issues related to decentralization, public-private partnerships and governance. The papers presented at the VI Brazilian meeting addressed various components of this good governance landscape. In particular, the international lecture underscored the relevance of enforcing transparency and accountability mechanisms for the ultimate goal of achieving effective development and democratic governance. While ICTs and globalization have enabled comparativists to collaborate on research projects, an effective convergence of comparative public administration (CPA) will materialize as international scholars and practitioners continue to explore various alternatives of sharing their research findings. SICA is spearheading this effort to converge CPA in public administration through the annual Riggs International Symposium, which provides an opportunity for comparativists from all over the world to meet and present their research. SICA is also planning to organize regional symposiums that will create opportunities for comparative administration scholars to discuss their research with the ultimate goal of building a regional body of administration knowledge. It is worth highlighting the 2015 Riggs Symposium that was held in Chicago, where public administration scholars from the United States, Netherlands, Singapore, Hongkong, Estonia, Brazil, Uganda, South Korea, Belgium and Rwanda spent a full day sharing their comparative reseach. Dr. Marco Ferreira, a Brazilian scholar, attended that symposium and shared the Brazilian open-data experience. As the nations of the world become more interdependent, it makes sense for public administration scholars and practitioners to engage in comparative approach in their research as well as their publishing and teaching. Embracing this research orientation is a pre-requisite for improving our understanding of administrative systems across cultures and countries and building an international body of public administration knowledge. Authors: Dr. Gedeon Mudacumura is SICA Chair and associate professor of public administration at Cheyney University of Pennsylvania. Dr. Marco Ferreira is SICA board member and associate professor of public administration at the Federal University of Vicosa in Brazil.